Castlevania is an American adult animated web television series based on the 1989 video game Castlevania III: Dracula's Curse and some elements from Castlevania: Curse of Darkness (2005) by Konami. The series follows Trevor Belmont, who defends the nation of Wallachia from Dracula and his minions. The series was originally planned as a film, developed by producer Kevin Kolde and his company Project 51. Kolde had a contract for a script with writer Warren Ellis in 2007; the project entered development hell until about 2015, when Adi Shankar boarded the project and it was picked up by streaming service Netflix. Powerhouse Animation Studios joined the team and production commenced. Its art style is heavily influenced by Japanese anime and Ayami Kojima's artwork in Castlevania: Symphony of the Night, with the production team including staff members who worked in the Japanese anime industry. The series premiered on Netflix on July 7, 2017, and was renewed for an expanded second season of eight episodes on the same day; the second season premiered on October 26, 2018. A ten-episode third season has been greenlit by Netflix. When his wife is burned at the stake after being falsely accused of witchcraft, the vampire Count Dracula declares all the people of Wallachia will pay with their lives. He summons an army of demons which overruns the country, causing the people to live lives of fear and distrust. To combat this, the outcast monster hunter Trevor Belmont takes up arms against Dracula's forces, aided by the magician Sypha Belnades and Dracula's dhampir son Alucard. Richard Armitage as Trevor Belmont, the last living member of the Belmont clan, an excommunicated family of monster hunters. James Callis as Adrian Alucard Tepes, the dhampir son of Dracula and Lisa Tepes, who seeks to protect humanity from his father. Graham McTavish as Vlad Dracula Tepes, a vampire who swears vengeance on humanity for the death of his wife Lisa, summoning an army of monsters to destroy all the people of Wallachia. Alejandra Reynoso as Sypha Belnades, a Speaker and the Elder's granddaughter who wields powerful magic. Emily Swallow as Lisa Tepes, Dracula's beloved wife who is burned at the stake after being falsely accused of witchcraft. In Wallachia in 1455, a young woman named Lisa who wishes to be a doctor seeks out Vlad Dracula Tepes, a vampire with advanced scientific knowledge. Intrigued by her courage and ambition, Dracula agrees to teach her, while she in turn offers to help him reconnect with humanity. The two eventually fall in love and marry. Twenty years later (1475), in the town of Târgoviște, Lisa is burned at the stake after a bishop discovers scientific equipment in her home and accuses her of witchcraft. Dracula is devastated and furious upon learning of his wife's death and declares the people have one year to make their peace, after which every human in Wallachia will die by his hand. His son Adrian tells him to instead go after the man responsible instead of all of humanity, but Dracula refuses to listen and attacks him. One year later, the archbishop hosts a celebration in defiance of Dracula. As promised, Dracula kills the archbishop, destroys the church and orders his demon army to kill every person left in Wallachia. As the army spreads across the land, the people place the blame on the kingdom's noble families, including the Belmonts. Following an altercation at a pub, Trevor Belmont seeks food and respite in the city of Gresit, which has been besieged by Dracula's forces every night. As he passes through town, he learns that the townspeople blame a group of magic users known as the Speakers for Dracula's assault. He saves their Elder from a pair of corrupt priests, who brings him back to his home to meet his fellow Speakers. Trevor insists they leave the city for their own safety, but the Elder refuses, as his grandchild has gone missing after venturing into the catacombs below the city in search of the "sleeping soldier", a legendary hero who they believe can defeat Dracula. Begrudgingly, Trevor agrees to retrieve the missing grandchild. Exploring the catacombs, Trevor realizes that they have been unusually constructed and contain devices matching old family descriptions of devices within Dracula's castle. Finding a stone statue in the visage of a Speaker, Trevor is attacked by a giant cyclops. He defeats the creature, releasing its curse, and rescues the Elder's grandchild, Sypha Belnades. After returning Sypha to her grandfather, Trevor is summoned to the church by the local bishop, the same bishop who ordered Lisa's execution. He orders Trevor to leave Gresit before sundown, as they plan to lead a mob to kill the Speakers, offering to spare Trevor and restore his family name in exchange. With the Speakers refusing to retreat, Trevor has them hidden in the cyclops' chamber and takes on the priests leading the mob before escaping into the city. Night falls as Dracula's army descends upon Gresit, killing the bishop. As Trevor continues his escape, Sypha appears to aid him, revealing herself as a powerful magic user. Trevor exposes the clergy's actions as the true reason for Dracula's invasion and assists the people in mounting a defense against the demons. During the battle, the floor crumbles beneath Trevor and Sypha and they fall deep into the submerged catacombs of the city. Making their way in deeper, they find the "sleeping soldier", revealed to be Adrian, who has spent a year healing from his last fight with Dracula. Adrian, now going by Alucard, engages Trevor in battle, but after seeing his and Sypha's resolve, Alucard relents and offers his aid, and the three prepare to challenge Dracula and end the conflict for good. A flashback depicts Lisa's home in Lupu being raided by the Bishop and his men while Dracula is away, resulting in her arrest to be tried before an inquisition. In the present, Dracula assembles his war council, made up of vampire overlords from across the world, and places human necromancers Hector and Isaac in charge of the war on humanity. The viking vampire Godbrand objects, believing they should rely on vampires instead of humans for leadership, but Dracula believes Hector and Isaac's hatred of their own kind makes them more trustworthy. As Gresit rebuilds after the battle, Sypha and Trevor see off the other Speakers while Alucard comes to terms with the decision to kill his father. At the castle, Godbrand laments to Hector that their war is being fought with no strategy apart from wanton destruction. Hector implies that Dracula wants all humans dead no matter the methods used, to Godbrand's disappointment. Dracula relocates the castle to a different location. Trevor and Sypha reunite with Alucard and ask how to locate Dracula's castle when it can move from place to place. Trevor recommends revisiting his old family estate, as the hold beneath the ruins contains plenty of information and tools for monster-hunting. At Dracula's castle, the vampire mistress Carmilla arrives and causes further discord among the council by criticizing Dracula's approach and inquiring his reasons of having not sired Lisa into a vampire. While traveling to the Belmont estate, Trevor's party is attacked by Dracula's forces; the group slays all the attackers, save one injured demon who escapes. At the castle, Isaac reminisces on his past, having killed his previous abusive master in a moment that shaped his ideals. Godbrand brings Isaac the injured demon, now dead, to extract information from it with his necromancy. At another assembly, the generals argue whether to continue their attack on Argeș or move the siege towards Brăila at Carmilla's suggestion. Isaac informs everyone of his findings, believing Alucard is working with a Belmont. Carmilla urges Dracula to keep watch on the Belmont estate, believing it may contain something that could destroy them. Carmilla tries to convince Hector to create creatures to send to the Belmont house while encouraging Dracula to select Brăila as their next target. Hector reminisces on how Dracula found him in the east of Rhodes and recruited him to raise an army, though Hector asked for a humane cull of humans rather than a cruel genocide. Trevor, Sypha and Alucard reach the ruins of the Belmont estate and open a magically-sealed door to a massive underground library. Sypha begins researching and Trevor locates several monster-hunting weapons, including the Morning Star whip, while Alucard is left uneasy by the various vampire remains preserved there. At Dracula's castle, Godbrand expresses his dissatisfaction with the plan to exterminate the human race, believing they will be left hungry without human blood to consume, and Dracula rebukes him. Carmilla tells Godbrand that Dracula must take the castle to Brăila, revealing how she killed the vampire who sired her after he became old and mad, deeming Dracula has become the same and unfit to lead them. Godbrand comes to agree with Carmilla that Dracula is not fit to lead and something must be done to change his plans. At the Belmont library, Trevor discovers a magical mirror which allows them to see things far away, and he bonds with Sypha. Carmilla continues to try to recruit Hector, intending to unseat Dracula if the castle is moved to Brăila. In a flashback, Isaac recalls how Dracula saved his life and recruited him to create his army. Godbrand and the other vampire generals grow tired of living without human blood and set out on demonic horses to a nearby village, slaughtering the people. Dracula speaks to Isaac about the war hall turning against him and confesses he lied to Hector about his intent to spare a few humans. Godbrand privately approaches Isaac and suggests that they should pursue the war without Dracula, Isaac killing Godbrand for his treasonous intentions. Isaac releases Godbrand's ashes from the castle rooftop while Carmilla commands her troops to assemble at Brăila. Hector convinces Isaac to agree to the attack on Brăila. Hector feeds this back to Carmilla and informs her that his night creatures have nearly reached the Belmont estate. Isaac discusses Hector's request with Dracula, but asserts that there is no betrayal to be concerned about. Dracula reminisces about a time he once savored killing humans but admits he is tired and cares only for results instead of the details. Carmilla and Hector approach Dracula and he approves the attack on Brăila. Afterwards, Carmilla turns on Hector, explaining he is now implicated in her impending betrayal of Dracula and cannot turn back on her plan now. At the Belmont library, Sypha discovers an unfinished locking spell that could be used to trap the castle in one place. The library starts to shake as Hector's night creatures arrive and attempt to break in. Trevor fights off the demons as Alucard uses the distance mirror to locate Dracula's castle so Sypha can attempt to complete the locking spell. Dracula moves the castle to Brăila, and most of the vampire generals lead troops across the bridge to attack the town. At Carmilla's behest, Hector reanimates the Bishop and makes him bless the river. Carmilla's troops reveal themselves and bring down the bridge, dropping many of Dracula's soldiers to be destroyed by the now-holy water. Dracula's remaining forces retreat to the castle whilst Carmilla's soldiers cross the river on makeshift bridges. The two armies begin to battle in the castle's main hall, while Carmilla and Hector move elsewhere. Sypha finishes the spell just as Trevor defeats the last of the demons, her struggle against the castle's mechanisms causing the castle to teleport within Brăila, landing in the river with most of the vampires of both factions killed by the holy water flooding into the castle. Sypha succeeds, disabling the castle's mechanisms while relocating it above the Belmont library. Emerging from the library, Trevor, Sypha and Alucard storm the castle and defeating the remaining vampires in the main hall. Dracula retreats to his study with Isaac, whom he sends through his magic mirror back to the desert to save the human from sacrificing himself to defend Dracula to the death. Alucard reaches the study and attacks Dracula, backed by Trevor and Sypha. The group manages to inflict some damage, but Dracula overpowers them, and engages in hand-to-hand combat with Alucard, moving through the castle as they battle. Eventually the two end up in Alucard's childhood room where Dracula has a break down upon realizing the reality of him trying to kill his own son. Dracula allows Alucard to stake him through the heart, while Trevor arrives to decapitate the decomposing vampire and Sypha burns the remains, leaving only his wedding ring intact. Alucard is upset about having killed his father, but Trevor and Sypha reassure him it was the right thing to do as they all walk out of the castle as morning dawns. Alucard intends to make Dracula's now-deserted castle his grave, but Trevor gifts him the Belmont library along with encouragement to protect both their ancestral homes while using their collective knowledge to help people. Meanwhile, Isaac murders a group of raiders and turns them into the first of his personal army. In Brăila, Carmilla decides return to Styria, enslaving Hector for his skills to quickly rebuild her forces and take advantage of the power vacuum left by Dracula's demise. Sypha convinces Trevor to stay with her and join her on new adventures battling monsters, and they bid farewell to Alucard and set off to find the Speakers. Left alone in the castle, Alucard reflects on the loss of his family and is overcome by grief. Warren Ellis wrote the series as a direct-to-video film before adapting it for a television format. In March 2007, Frederator Studios acquired the rights to produce an animated film adaption of Castlevania III: Dracula's Curse, intended as a direct-to-video production. 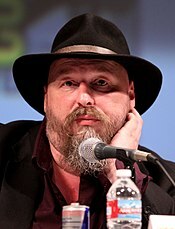 Frederator brought writer Warren Ellis aboard as the screenwriter for the series. In an interview with Paste, Warren Ellis said that when he was contacted about Castlevania he had no previous knowledge of the series and discovered it was a "Japanese transposition of the Hammer Horror films I grew up with and loved". Ellis explained how he worked with Castlevania producer Koji Igarashi to fit the film into the timeline of the series, including writing a new backstory, and how he was frustrated that Igarashi wanted eight full re-writes of pre-production material before giving approval. Ellis noted that Frederator's Kevin Kolde, who was slated to produce the work, did not want the film to be aimed at children, allowing Ellis to use gruesome imagery and scenes as necessary to tell the story he wanted to write, something that Ellis had found restrictive in working with normal television animation. In adapting the game for the film, Ellis did not want to make a point-for-point adaption, but instead provide some material to flesh out the game's world and elements behind it. At this stage, the film was anticipated to be only 80 minutes long, which Ellis knew would not be enough to tell the full story he wanted, so was able to break apart his script into a trilogy of works, each part having a self-contained three-act structure; the first part would be to introduce the characters of Dracula, Trevor, Sypha, and Alucard and with a meaningful narrative resolution. In this manner, Ellis noted that if the other two parts were never greenlit, the first work "doesn't demand the presence of the other two parts for it to work as its own thing". Due to the limited time, Ellis opted to drop Grant Danasty, a pirate character in the game; Ellis noted that besides "the stupid name", he felt the pirate was misplaced in the setting and that the limited run time would not allow him to develop the character fully. Sometime around 2008, work on the production stalled, and entered development hell. Ellis had completed his script in June 2008, and the show's production blog had said in August 2008 that they were shopping around the idea as a theatrical release, but no further updates followed before the blog was quietly deleted. Around 2012, Adi Shankar was approached to direct a live-action version of Ellis' script. Shankar, who at the time had just finished work as executive producer of Dredd, said that the party was looking to make a film in the style of the Underworld films with a similar budget, representative of a small studio with large independent backing. Shankar turned the opportunity down, saying it felt "250 percent wrong", as he had deep respect for the original game and felt the live-action version would not treat it well. Following this, Shankar stepped back from Hollywood to pursue more self-published works, stating that "the major studios were blatantly disrespecting fandom" as a reason he turned down the offer. The show was revitalized when Powerhouse Animation Studios's Sam Deats was able to negotiate a deal with Netflix for the production, using the existing scripts that had been written nearly a decade prior. Powerhouse reached out to Frederator to help with the show's production. According to Ellis, Netflix was very positive about his original scripts that he wrote in 2007, and so he had to only make a few changes to fit the Netflix format while staying true to the version of the script Konami had accepted. Shankar was approached with the opportunity to produce the work, which he took as neither Powerhouse or Frederator sought to restrict his creative vision from Ellis' scripts. Fred Seibert and Kevin Kolde of Frederator Studios also co-produce. The series was animated by Frederator Studios and Powerhouse Animation Studios and directed by Sam Deats. Trevor Morris composed the show's music. The show's art style was heavily influenced by the work Ayami Kojima did for Castlevania: Symphony of the Night. They also took ideas from director Satoshi Kon's works for character expressions and series such as Cowboy Bebop and Berserk for inserting humor among the more serious elements. The show is produced using 2D hand-drawn animation, taking cues from Ninja Scroll and Vampire Hunter D, with staff members that previously worked on Vampire Hunter D: Bloodlust. The manga series Berserk and Blade of the Immortal were also cited as inspiration, with one of the show's animation directors having previously worked on the Berserk films. The production works closely with Konami, the holders of the Castlevania franchise, who helped to identify small continuity issues but were otherwise very receptive towards the work. The first season of four 30-minute episodes was released on July 7, 2017. This season represents the first part of the trilogy that Ellis has laid out in 2007. The second season is eight episodes long and was released on October 26, 2018. Ellis said that the second season, completing the trilogy, is where he had been able to deviate somewhat from the game, and has been better anticipate the show's release on Netflix in terms of scenes and episode lengths. Shankar believes that there is an opportunity for more stories to be told borrowing from other games in the series, noting that overall he sees the series as "a story about a family and multiple generations of this family" with many tales to draw from. The production team for the second season included staff members who worked on Madhouse productions such as Death Parade. Developing the character of Dracula, showrunner Adi Shankar made it clear that one of the series' main goals has been to paint Dracula not as a villain, but a tragic, doomed figure. According to him: "The best villains, in general, are the heroes of their own story and the trick to making Castlevania resonate was this idea that Dracula isn't a bad guy, he isn't a villain, he's just a person consumed with darkness. That first episode in Season 1 we start to see why he wants to eradicate humans. He's not just this mustache-curling, one-dimensional villain. What Dracula is doing is not really a war against humanity. It's more a suicide note." The show's third season was greenlit by Netflix a few days after the broadcast of the second season. Shankar announced in November 2018 that he will also be leading an animated series based on Capcom's Devil May Cry, which he acquired the rights for himself, and will make the show, alongside the Castlevania series, part of a shared "Bootleg Multiverse". According to Parrot Analytics, Castlevania was the most popular digital original series in the United States during July 6–19, 2017, with the show generating 23,175,616 "demand expressions" on average. According to Parrot Analytics, "demand expressions" indicate the "total audience demand being expressed for a title, within a country," measured by video streams and downloads as well as social media. It remained the 7th most in-demand digital original show in the United States through October 11, 2017. By the end of 2017, Castlevania was the year's 15th most in-demand digital original series in the United States, averaging 18,137,196 demand expressions throughout the year. It was also one of the year's top 20 most in-demand digital original series in the United Kingdom (20th), Japan (4th), Brazil (10th), Mexico (11th), France (13th), Canada (14th), Germany (19th) and Australia (20th). On the review aggregation website Rotten Tomatoes, the first season has a rating of 80%, based on 24 reviews, with an average rating of 7.39/10 and a critical consensus that reads "Castlevania offers spectacular visuals and a compelling adaptation in its all-too-short first season". It is the first video game adaptation in the site's history to receive a "Fresh" rating. Metacritic, which assigns a rating out of 100 to reviews from mainstream critics, reported that there were "generally favorable reviews" for the first season, with an average score of 71 based on 4 reviews. The Verge gave a mixed review, noting that the gore did little to create a sense of danger and felt "intentionally flashy". It concluded that "Castlevania is ripe with potential, but also burdened with cliches." Dave Trumbore of Collider gave the series four stars out of five, praising the chemistry between the cast and comparing the violence with anime such as Ninja Scroll. IGN also wrote glowingly of Warren Ellis's script, but felt some of his humor was a little jarring. In a review for Paste Magazine, Dave Raposo wrote that Castlevania channeled the cutaway gag formula that is seen in Family Guy. He dismissed the "absurd" attempts at humanizing Dracula and called it a "milquetoast imitation of Game of Thrones", noting that the ambitions of the script "fly in the face of the simple ideals that unify the best entries in the Castlevania series". Several reviews lauded the voice cast, particularly Graham McTavish as Dracula and Richard Armitage as Trevor Belmont. Screen Rant's Sarah Moran drew attention to the "sarcastic edge" that Armitage brought to the character, and also noted Callis's "air of sophistication" as Alucard. Destructoid also wrote positively of Trevor Belmont as a protagonist, but criticized the animation and added that the character designs were "flat". Dan Seitz at Uproxx left a negative review, writing that it tried too hard to find profundity in the story of the Castlevania series. He also cited issues with the pacing. On Rotten Tomatoes, the second season received a rating of 100% with an average score of 9.7/10 based on 12 reviews. Complaints were made towards the pacing and the screen time spent on Dracula's court in season two. Writing for GameSpot, Michael Rougeau was disappointed that Trevor's group spent the first six episodes in a library, though in reality they only arrived in episode 3, and also said Dracula "does literally nothing in all the episodes we've seen so far. There's one medium length flashback in which he massacres a council of merchants who offended him, but it's not like that moves the story along". Rougeau concluded that the action was creatively executed, but he felt that the new cast was given more development and that the previous characters were left to "tread water". Film School Rejects echoed similar sentiments, who said the second season was more of a complement to the first one. McTavish and the rest of the voice cast were once again met with high praise. In Collider's review for the second series, Dave Trumbore mentioned there "isn't a weak link in the cast here". WhatCulture wrote very positively of the voice work and also noted the new performances, including Jaime Murray as Carmilla and Adetokumboh M'Cormack as Isaac. IGN gave the second season a 9.2/10, praising Ellis's approach to Castlevania as "witty and self-aware enough to poke fun at itself when necessary". ^ a b c d e f Glagowski, Peter (July 10, 2017). "10 years of purgatory wasn't enough to keep Netflix's Castlevania down". Destructoid. Retrieved July 10, 2017. ^ a b c Narcisse, Evan (August 2, 2017). "The Animation Studio That Made Castlevania Explains Why It Was a Dream Project". io9. Gizmodo. ^ Hill, Jacob. "Netflix Quietly Announces Castlevania Series For 2017". CBR.com. Retrieved February 8, 2017. ^ a b Petski, Denise (July 7, 2017). "'Castlevania' Animated Series Renewed For Season 2 By Netflix". Deadline Hollywood. ^ a b Pederson, Erik (October 31, 2018). "'Castlevania' Renewed For Season 3 On Netflix". Deadline Hollywood. Retrieved October 31, 2018. ^ a b c d e f g Fitzpatrick, Kevin (June 28, 2017). "Netflix 'Castlevania' Voice Cast Includes 'Preacher,' 'Hannibal' Alum". Screen Crush. Retrieved June 29, 2017. ^ a b c d Donaldson, Kayleigh (October 26, 2018). "Castlevania Season 2 Voice Cast and Character Guide". Screen Rant. Retrieved October 26, 2018. ^ a b c d e Egan, Toussaint (July 7, 2017). "Warren Ellis on Castlevania, the Legacy of Hammer Horror, and the Creative Liberation of Writing for Netflix". Paste Magazine. Retrieved July 8, 2017. ^ Alexander, Julia (2017-07-07). "Netflix's new Castlevania series is the most bingeable show at just under 100 minutes". Polygon. Retrieved 2017-07-07. ^ a b c d Johnson, Rich (February 9, 2017). "The First Time Warren Ellis Wrote A Castlevania Animation, Ten Years Ago". Bleeding Cool News. Archived from the original on March 11, 2017. Retrieved July 11, 2017. ^ a b c d Alexander, Julia (July 11, 2017). "Castlevania producer turned down live-action adaptation because 'it felt wrong'". Polygon. Retrieved July 11, 2017. ^ a b Williams, Mike (February 8, 2017). "Castlevania Headed To Netflix in 2017, From Warren Ellis and Adi Shankar". US Gamer. Archived from the original on February 11, 2017. Retrieved February 8, 2017. ^ Trumbore, Dave. "Super Violent 'Castlevania' Animated Series Coming from Producer Adi Shankar". Collider.com. Archived from the original on August 26, 2015. Retrieved August 26, 2015. ^ Melrose, Kevin. "Castlevania TV Series Seemingly Confirmed By Adventure Time Producer". CBR.com. Archived from the original on December 31, 2016. Retrieved December 30, 2016. ^ "Channel Frederator". Channel Frederator. Retrieved 2017-06-01. ^ Knelman, Martin (February 7, 2017). "Animating guru Hirsh is back with new company, Netflix project". The Globe and Mail. Archived from the original on February 7, 2017. Retrieved February 8, 2017. ^ "Interview: Adi Shankar Discusses Castlevania And Assassin's Creed". WWG. ^ Barder, Ollie. "New Netflix 'Castlevania' Animated Series Goes Full On 'Vampire Hunter D' And Looks Suitably Great". ^ Dornbrush, Jonathan (February 8, 2017). "Netflix Announces Animated Castlevania Series". IGN. Archived from the original on February 9, 2017. Retrieved February 8, 2017. ^ Pereira, Chris (May 24, 2017). "Watch The First Trailer For Netflix's Castlevania Show; Release Date Announced". GameSpot. Archived from the original on June 26, 2017. Retrieved May 24, 2017. ^ Schedeen, Jesse (October 27, 2018). "Castlevania Season 2: Showrunner on Why Dracula Is 'Consumed With Darkness'". IGN. Retrieved November 16, 2018. ^ Griffin, David (November 16, 2018). "Devil May Cry Series Joins Castlevania In New Multiverse From Adi Shankar". IGN. Retrieved November 16, 2018. ^ "Anime-style Netflix series 'Castlevania' proved to be a hit with audiences". Found Remote. 2017. Retrieved April 29, 2018. ^ "The Global Television Demand Report" (PDF). Parrot Analytics. 2017. Retrieved April 29, 2018. ^ a b Schneider, Michael (October 18, 2017). "Netflix's 'Ozark' Was Most Popular Streaming Show This Summer, According to New Audience Metric". IndieWire. ^ "Castlevania: Season 1 – Rotten Tomatoes". Rotten Tomatoes. Retrieved September 16, 2018. ^ "Netflix animated series just lifted a curse: It's the first video game adaptation to get a Fresh rating". Rotten Tomatoes. Retrieved July 20, 2017. ^ "Castlevania – Season 1 Reviews – Metacritic". Metacritic. Retrieved July 10, 2017. ^ Moore, Michael (July 7, 2017). "Netflix's Castlevania isn't a perfect video game adaptation, but it's on the right track". The Verge. Archived from the original on July 9, 2017. Retrieved July 7, 2017. ^ Trumbore, Dave (July 8, 2017). "'Castlevania' Review: Netflix's Video Game Adaptation Has Some Serious Bite". Collider. Archived from the original on July 8, 2017. Retrieved July 8, 2017. ^ a b Schedeen, Jesse (July 8, 2017). "CASTLEVANIA: SEASON 1 REVIEW". IGN. Retrieved July 8, 2017. ^ Raposo, Dave (September 7, 2017). "Netflix's Castlevania Series Forgets What Makes the Games Work". Paste Magazine. Retrieved September 7, 2017. ^ Moran, Sarah (July 7, 2017). "Netflix's Castlevania Season 1: Every Episode Reviewed". Screen Rant. Archived from the original on July 9, 2017. Retrieved July 7, 2017. ^ Valdez, Nick (July 7, 2017). "Review: Castlevania (Season 1)". Destructoid. Archived from the original on July 9, 2017. Retrieved July 7, 2017. ^ Seitz, Dan (July 11, 2017). "Netflix's 'Castlevania' Tries Too Hard To Make A Silly Game Profound". Uproxx. Archived from the original on July 9, 2017. Retrieved July 11, 2017. ^ Rougeau, Michael (October 30, 2018). "Netflix's Castlevania Season 2 Full Review: Dark Metamorphosis". GameSpot. Retrieved November 2, 2018. ^ Shields, Meg (October 20, 2018). "'Castlevania' Season 2 Review: Blood, Guts, and Backstory". Film School Rejects. Retrieved November 2, 2018. ^ Trumbore, Dave (October 26, 2018). "'Castlevania' Season 2 Review: Bigger, Bloodier, and with More Bite Than Ever". Collider. Retrieved November 2, 2018. ^ Dapul, Motzie (October 30, 2018). "Castlevania Season 2 Review: 7 Ups And 2 Downs". WhatCulture. Retrieved November 2, 2018. ^ Schedeen, Jesse (October 26, 2018). "Netflix's Castlevania Season 2 Review". IGN. Retrieved November 2, 2018.